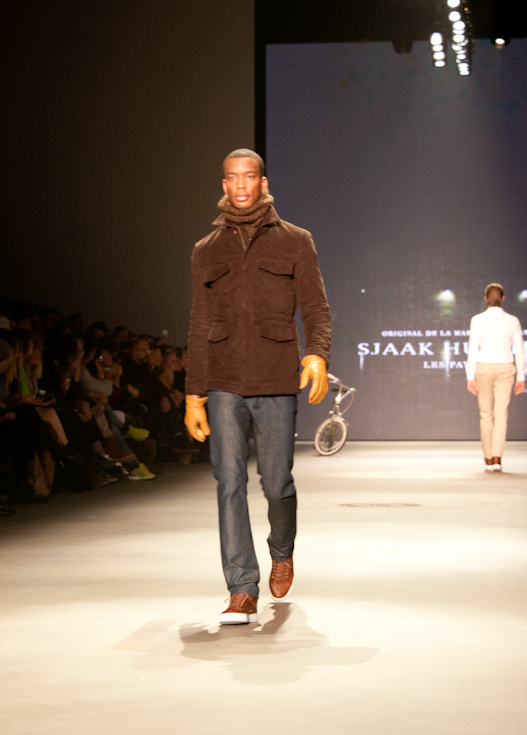 Today I popped my ‘men’s collection’ cherry at the Sjaak Hullekes fashion show. 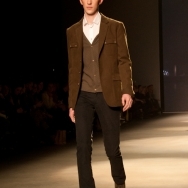 I really didn’t know what to expect or what kind of interesting things I would be able to tell you about men’s fashion. 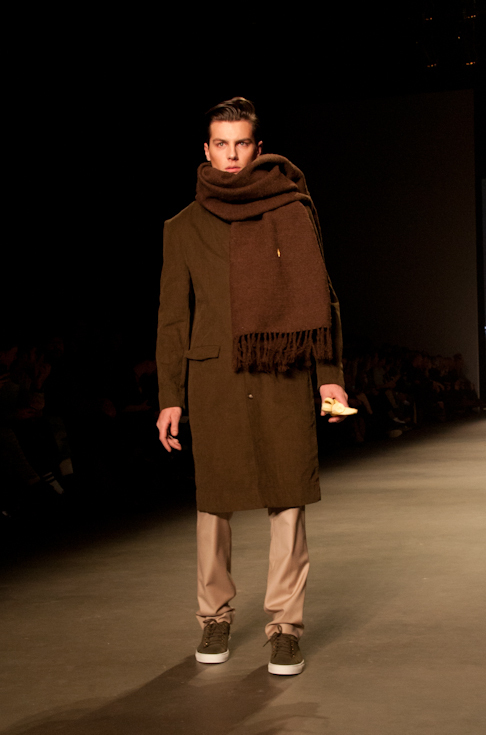 And although this single collection does not make me an expert in menswear -yet-, Sjaak Hullekes left me with enough to show you. 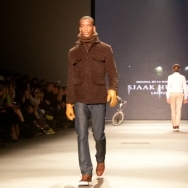 Sjaak Hullekes is known for his classical, clean looks. 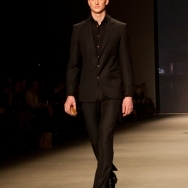 He wraps men in nice underwear, classy suits and well-dressed shirts. 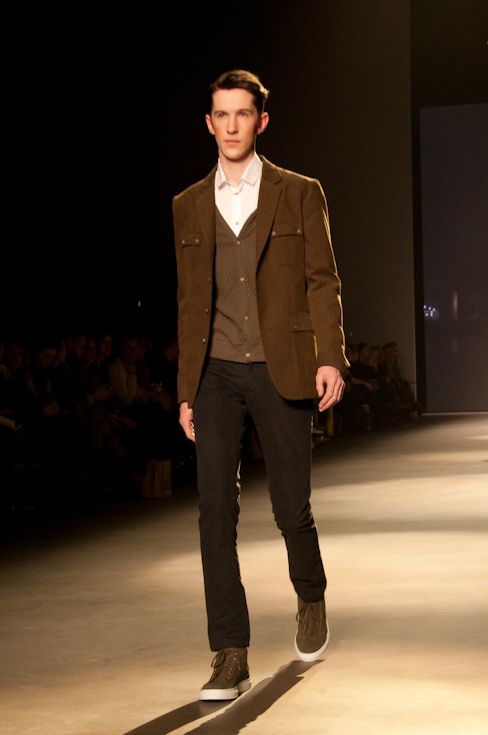 With a slight nostalgic feel to his garments, he takes us back to the time when men used pomade to temper their greaser and polished their shoes. 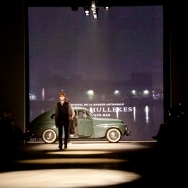 The show opens with a guy on a bicycle, cycling down the runway. 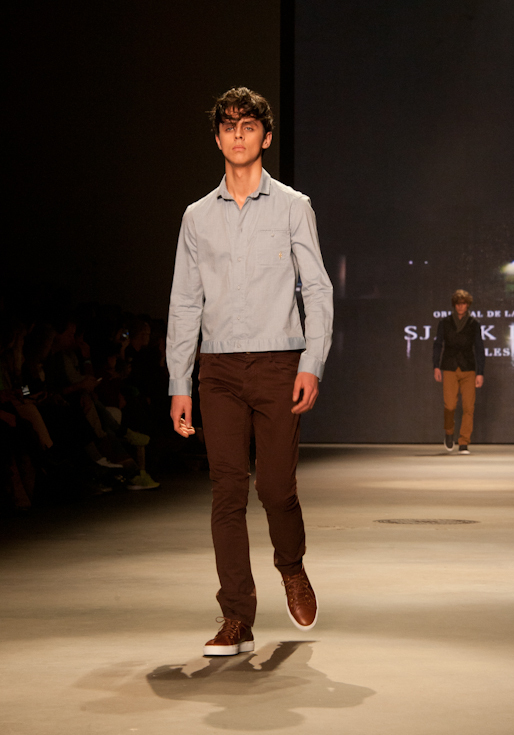 Two boys follow, running down the runway. It all goes pretty fast, and because of the surprise element everybody immediately focuses. A 50’s blue car drives on stage. The doors open and three boys climb out of it. They are casually dressed in sneakers, loose fitted pants and soft jumpers. In their hands, they hold things like a banana, a sandwich and a newspaper, as if they’re on their way to work at an office. 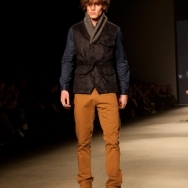 The main colours are brown and blue, combined with denim and some natural hues, like off-white and beige. This collection shows us a lot of basics. 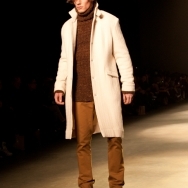 Wool coats with knitted collars and sleeves, mixed fabrics, cotton trousers and comfy cardigans. 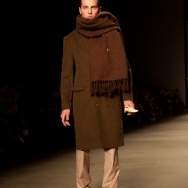 Here and there, an occasional hat or oversized scarf finishes the look. Then, the suits. 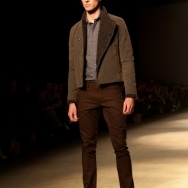 The male models look as handsome as can be. 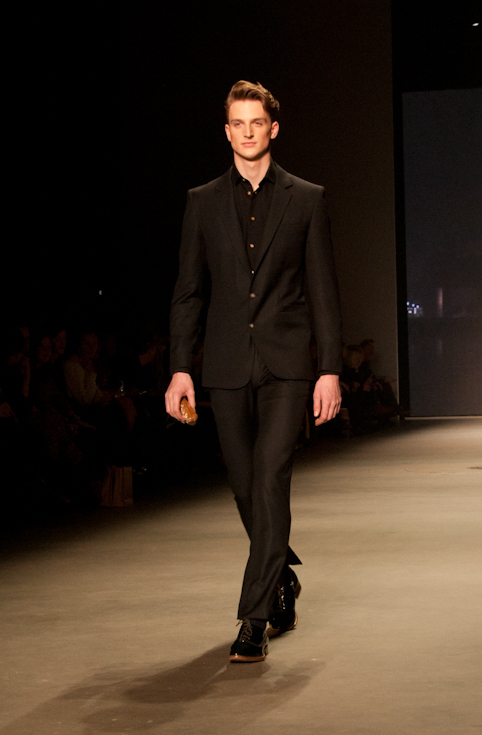 Smooth, slim-fitted suits, paired with shiny brogues. The suits are combined with crisp shirts, and, one look I really like; a turtle neck in mustard yellow worn under a brown suit. Very retro and very cute. The only thing I really don’t understand are the hand-held hats. They would have looked great on their heads. A nice suit requires a nice coat. 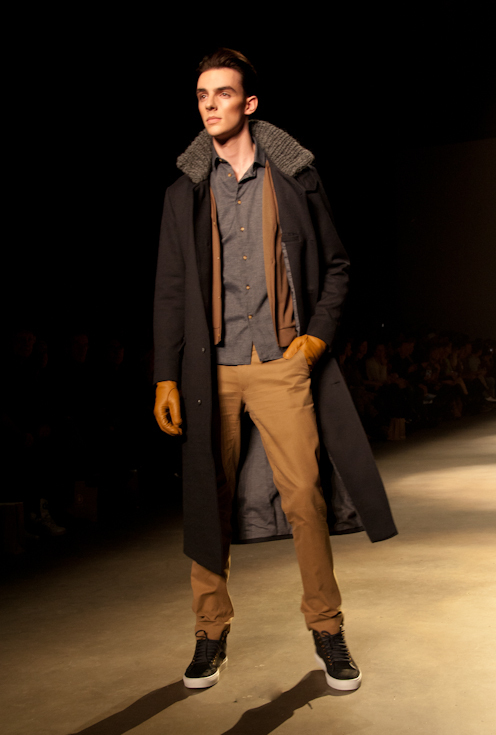 Sjaak Hullekes shows us some beautiful macs, calf length, gloves and a scarf for a nice, clean winter look. 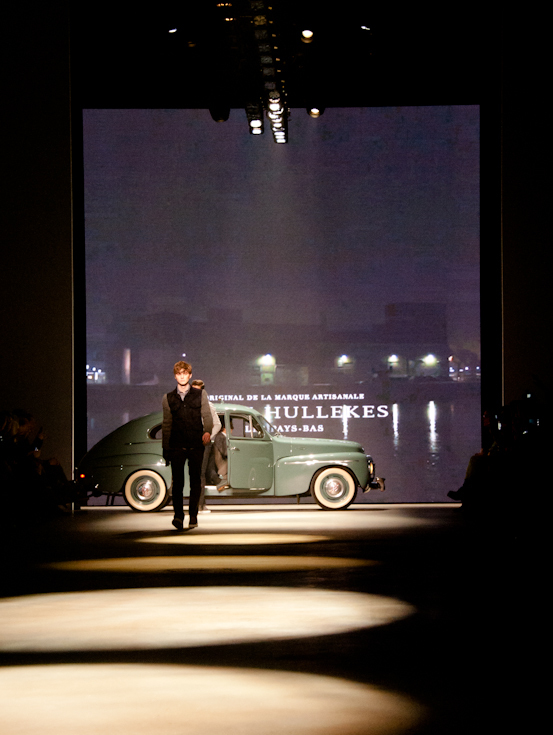 The show ends when the blue car comes back with Sjaak Hullekes himself sitting in the passenger’s seat. 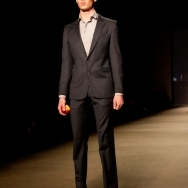 He remains seated for a while, and after the models run down the runway for the grand finale, he gets out and receives his well-deserved applause. 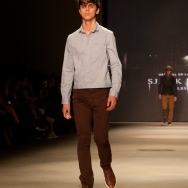 Overall, I think the show was really good and well-executed. 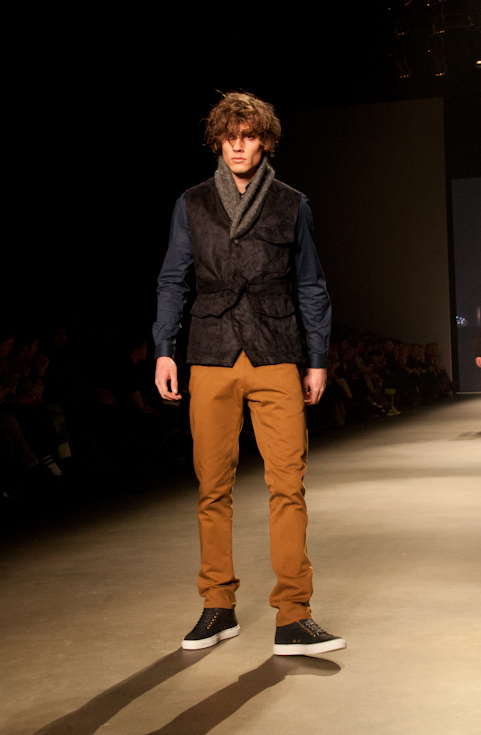 I wish Dutch men would learn how to dress a little more like Sjaak Hullekes models. 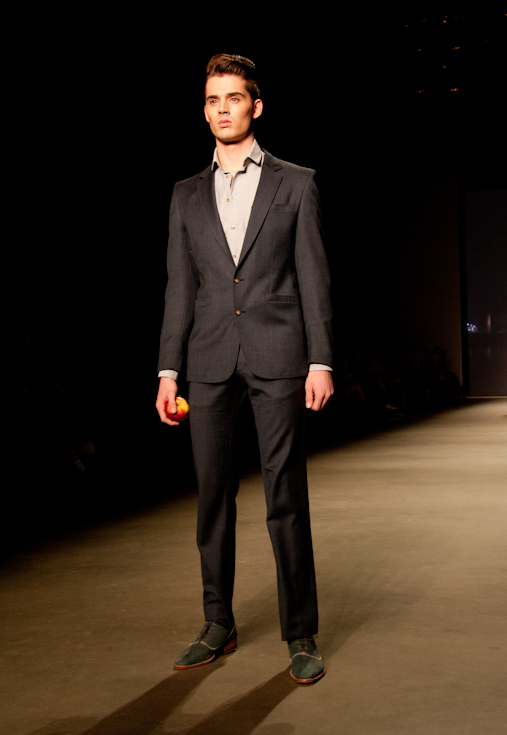 Don’t be afraid boys, the sneakers are still allowed, as long as they are combined with classy and clean-cut basics. 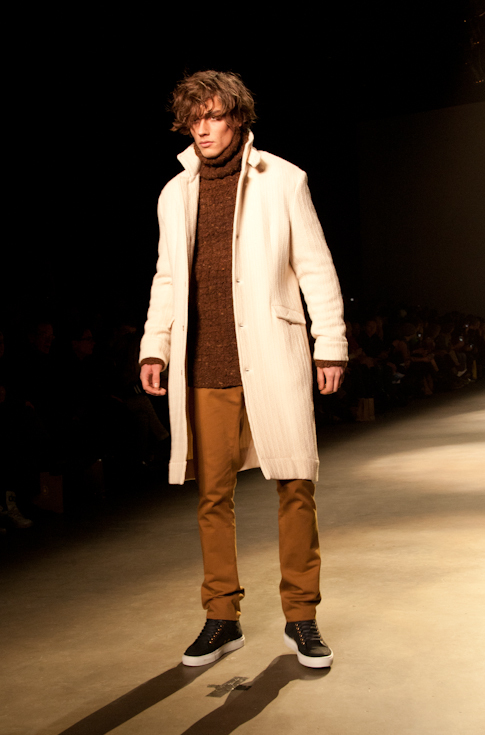 The overall street-view would be so much nicer with a few well-dressed men to look at!